Element: The Palette Library folder is stored directly in the drawing Element folder. Scene: The Palette Library folder is stored directly in the Scene folder. Job: The Palette Library folder is stored in a Job folder contained in the Scene folder. Environment: The Palette Library folder is stored in an Environment folder contained in the Scene folder. By default, the palette is stored at the scene level. For simple projects and standalone projects, it is recommended to keep it as is. If you work with a larger studio, it is recommended to verify with them on the file structure. This existing structure is compatible with Harmony Server. Harmony’s database has a leveled structure starting from the Environment down to the Element. Its client-server configuration allows all data, such as palettes and scenes, to be shared between a series of client machines. Working with Harmony Stand Alone, the Element level is very useful when there are a lot of different palettes. When a colour model drawing is created, it is stored in its element folder. By storing the corresponding palette file with the colour model, the colourist can load them both from the same location. This also creates a more organized structure. Working with Harmony Stand Alone, a palette file can also be saved at the scene level, so that all of the palettes from the scene are stored together. The palette naming must be structured so the colourist or character builders can find the correct one. Saving the palettes at the scene level makes it very easy to back up the palettes and retrieve their location. The scene level can also be useful for cut-out animation. Instead of creating a colour model scene that includes all of the characters, props, effects, and location, the colour palette or model will often be directly imported to, or created in, the character building scene. Just as with a cut-out character building scene, each element uses the same palette so it would not be efficient to save the palette inside one element. Instead, it is saved at the scene level. This prevents a palette overload because all of the models are in different scenes. It also allows each scene to have its own set of palettes corresponding to its model. When working on a cut-out animation production, it is highly recommended that you work with the Scene level. The palette storage location depends on the type of production and the backup plan being used. Some studios like to store their palettes at the Element level and others at the Environment level as this will not create a problem so long as the scene is in the Harmony structure. In fact, as long as the Harmony structure is maintained it can be stored at any level. However, difficulties may occur when the scene is backed up or transferred to another studio or database and removed from the structure. Because of the Harmony client-server configuration, all of the data can be shared through all of the scenes in the database. 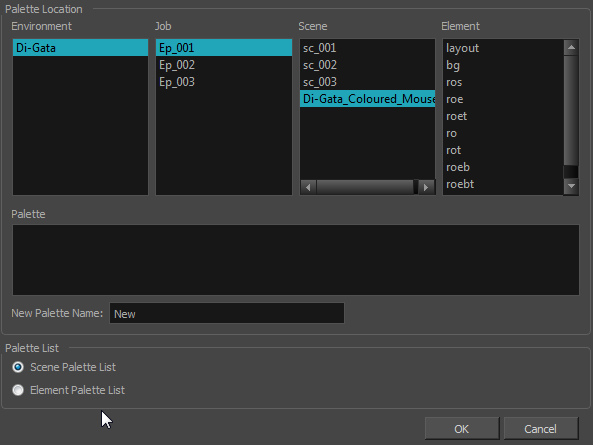 This also includes the palette files, even if they are stored at the Element, Scene, Job, Drawing or Environment level. The palette files can be accessed from any scene of any project. When you export scenes from Harmony to either archive or send them to other users or studios, the palettes stored in external scenes, jobs or environment will NOT be exported. An exported scene will carry palettes stored in its own Element’s Palette Library, scene’s palette library, the Job and the Environment where it is stored. Any other palette from other Environments, Jobs, Elements or Scenes (even from the same job) will NOT follow. Instead a recovery palette will be created when the scene is reopened in another Harmony system. A recovery palette is a local palette created by the system when palettes and colours are missing. This palette is no longer shared with the rest of the project. 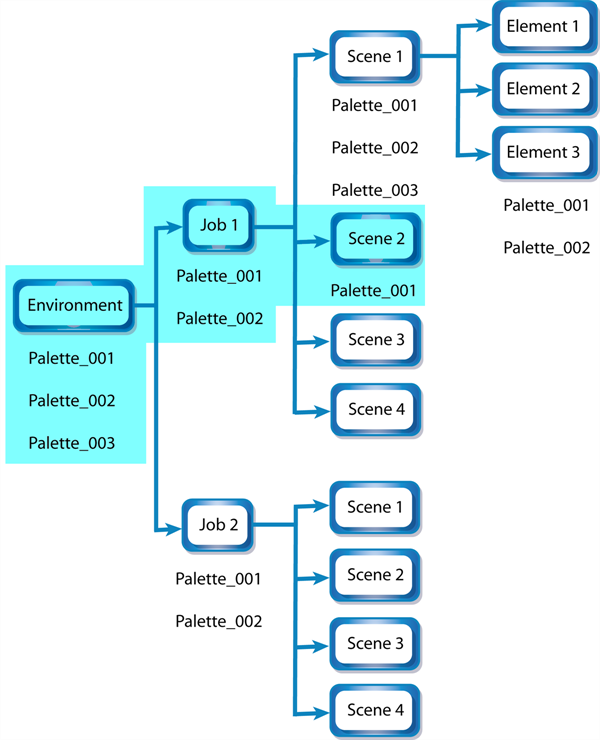 For example, in the following chart, if you export Scene 2 from Job 1, the package will carry the palettes from Scene 2, Job 1 and Environment. It WILL NOT carry the palettes from Element 3 in Scene 1, Scene 1 and Job 2. If Scene 2 was linked to any of these, the system will create a recovery palette the next time Scene 2 is opened in another Harmony system. To store your palette with their colour models, you can use the Element level, however, it will require more structure when exporting the scenes. The scene will have to be exported along with its colour model scene. The other studio you are working with must recreate an identical structure to yours, then import the received scenes into the same location as you have them in order to maintain the links. When sharing palettes between scenes, some users may accidentally modify the colours, even though the palettes are locked by default. That is why it is a good idea to copy and back up your palette libraries and master palette directories. When a palette file is copied, it automatically becomes a clone palette, so there will not be any trouble replacing an altered file. Harmony automatically updates all of the files and drawings linked to it.